Since its arrival on Oct. 3, the USNS Comfort provided medical care for more than 100 triage, long-term care or critical care patients. In the four weeks since Hurricane María made landfall on Puerto Rico, the Federal Emergency Management Agency (FEMA) and its federal and local partners, have been making progress in the nation’s most logistically complex response in FEMA history. For Puerto Rico, Hurricane María was a catastrophic event causing damage beyond that of most storms. Puerto Rico, a territory roughly the size of Connecticut, is more than 1,000 miles from the continental United States, creating logistical challenges bringing millions of pounds of cargo to the island. After landfall, Puerto Rico was left without potable running water. Waist-deep flooding, mudslides and winds powerful enough to uproot the concrete foundations of metal utility poles, impacted more than 80 percent of the island’s power grid. In addition, the existing infrastructure for cellular and wireless service was rendered virtually useless further hampering communications. Rebuilding will take years. Despite this unprecedented level of devastation, the progress being made since the storm will rewrite national disaster response history. More than 16,500 federal employees and 74 voluntary agencies remain focused on gaining stability in five critical areas that include delivering meals and water to communities in need, restoring power, maintaining a sound medical support structure, and protecting property against further damage from wind and rain. FEMA’s coordinated response to provide meals and water is one of the longest sustained disaster air operations in U.S. disaster-relief history. More than 650 flights have been logged in support of crucial humanitarian efforts, flying more than 700 air drops of food and water pallets to stranded storm survivors. Running water has been restored to more than 65 percent of clients served by the Puerto Rico Aqueduct and Sewer Authority (PRASA). Through the combined efforts of the federal government, the government of Puerto Rico and voluntary agencies, more than 600,000 meals a day have been distributed across the island. More than 200 schools, as well as shelters and senior centers, served as community feeding centers. To date, more than 10 million liters of bottled water and more than 3.6 million gallons of potable bulk water have been distributed. The emergency power restoration underway is the largest temporary power mission for the 249th Engineer Battalion ever on U.S. soil. The U.S. Army Corps of Engineers is supporting the planning, coordination and integration efforts to repair the electrical power grid, as well as temporary power needs on the island. To date, the U.S. Army Corps installed more than 134 generators to critical infrastructure, and completed more than 400 generator assessments. One of the world’s largest planes transported two crucial new generators, turbines and connecting equipment for the Palo Seco Power Plant to supply electric power to the city of San Juan. While a temporary fix, the generators will help to increase reliability on power generation and reduce power outages to the customers already receiving power. At the same time, more than 1,000 linemen, more than 50,000 poles and 6,500 miles of cable are en route to support the restoration of the power transmission and power distribution across the island. The medical support provided in Puerto Rico is one of the largest federal medical operations ever launched for a disaster. There are nearly 2,000 federal medical and support personnel deployed to Puerto Rico and they have cared for more than 6,100 people. The U.S. Department of Health and Human Services (HHS) has more than 500 personnel from the National Disaster Medical System (NDMS) and the U.S. Public Health Service (USPHS) deployed to Puerto Rico. These medical personnel are providing care in nine locations throughout the island, delivering care to survivors where hospital facilities are overwhelmed or unavailable. HHS medical teams provide emergency care tailored to the specific needs of each location, ranging from primary and acute care to triage, resuscitation and stabilization. The Department of Defense is leveraging land, air, and seaborne assets to deliver medical supplies and transport patients from isolated communities for care in other areas of Puerto Rico. To supplement the need for advanced medical care, the U.S. Army’s 14th Combat Support Hospital (14th CSH) deployed a 44-bed mobile hospital in Humacao, Puerto Rico. The 14th CSH is able to provide health service support in the form of curative, preventive, and stabilization for evacuation. 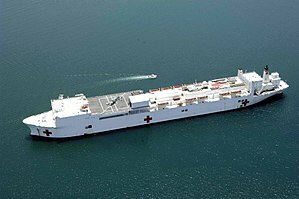 In some instances, when critical care patients need levels of care beyond what is available at a local hospital, the patient may be evacuated to the hospital ship, USNS Comfort. Since its arrival on Oct. 3, the USNS Comfort provided medical care for more than 100 triage, long-term care or critical care patients. Three patients are still receiving long-term care. Doctors also delivered the first baby born on the Comfort since 2010. In honor of the occasion, the Comfort’s current Ship’s Master, Roger Gwinn, ceremoniously renamed one of the ship’s two small boat tenders the Sara Victoria. More than 42,000 tarps have been distributed to aid residents in protecting their damaged roofs from wind and rain. The USACE installed more than 400 blue roofs through the blue roof program. To date, FEMA approved more than $87 million in housing assistance and $336.2 million in public assistance for local governments and nonprofit organizations. In addition, the SBA has approved more than $1.2 million in low-interest disaster loans. The aid comes to Puerto Rico as a result of the major disaster declaration signed by President Trump last month. Hey Buddy!, I found this information for you: "Op-Ed: FEMA provides Hurricane María progress report". Here is the website link: https://newsismybusiness.com/provides-hurricane-progress/. Thank you.